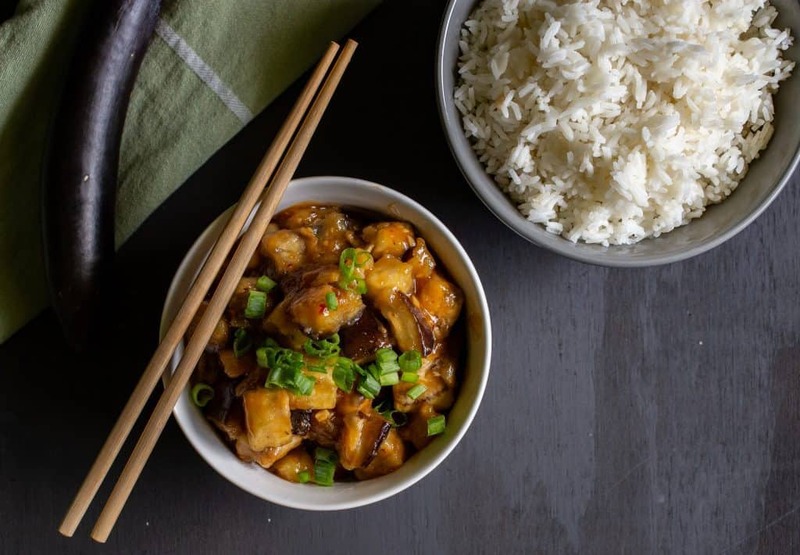 A simple recipe for Sichuan eggplant: Creamy cubes of eggplant with a sweet, spicy and savory sauce. One of my favorite dishes from my years in China is Sichuan eggplant. When I was living in Nanjing, there was a tiny hole-in-the-wall restaurant in an alley on my way home from work that I would stop by frequently for takeout. The restaurant was smaller than my bedroom with the “kitchen” area the size of my kitchen table, yet they still managed to churn out wonderful meals quickly. I learned some Chinese in college and continued to take lessons in Nanjing, but I was always shy about speaking to strangers in Chinese so it took me months to work up the courage to go into little restaurants like this on my own with staff who only spoke Chinese and no written menus to fall back on. I was always better at reading Chinese than speaking, maybe because reading gave me time to process my thoughts without letting on what I didn’t fully understand. Once I finally worked up the courage to order from this restaurant, I would get Sichuan Eggplant (鱼香茄子 yúxiāng qiézì) and Kung Pao Chicken (宫保鸡丁 gōngbăo jīdīng) at least once a week for me and my now husband, Alex. Yúxiāng qiézì literally translates as ‘fish fragrant eggplant’, a name that I’ve never quite understood since the dish contains no fish, no fish sauce, and doesn’t smell like fish either. I’m referring to it in English as Sichuan eggplant. It’s made of sautéed or wok-fried eggplant with a sauce that’s sweet, spicy and savory. It would typically be served as one of many dishes at a restaurant or banquet, but I like it so much that I can just eat the eggplant with rice as my entire meal. The recipe is simple. Saute some eggplant tossed in cornstarch until cooked through. Mix up the sauce, cook for a few minutes until thickened, and then combine the sauce with the eggplant. 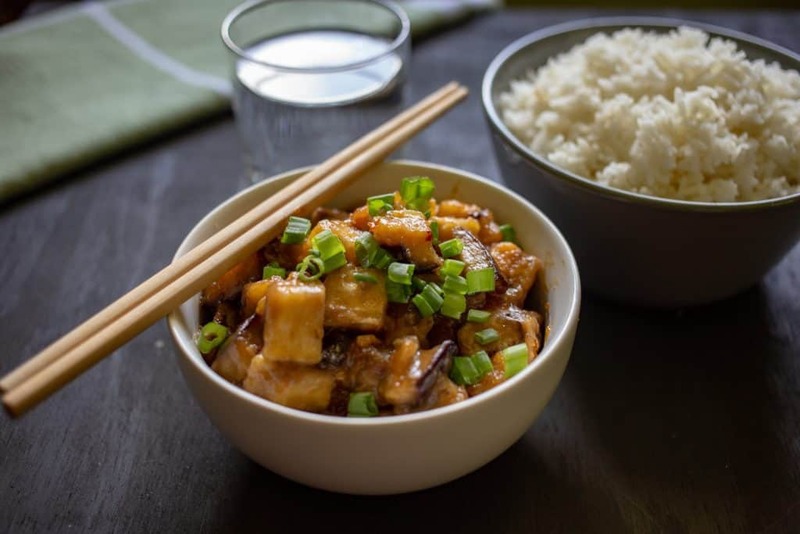 Leave a comment and review below if you try this Sichuan Eggplant to let me know what you think! Creamy cubes of eggplant with a sweet, spicy, and savory sauce. Cut the eggplant into 1/2 to 3/4 inch cubes. In a large bowl combine 1/2 cup corn starch with the eggplant and toss to coat. Heat a large nonstick skillet over medium heat. Add 3 tablespoons vegetable or peanut oil, then add the eggplant and stir occasionally until the eggplant is cooked through, about 7 minutes. Move the eggplant to a bowl and place the skillet back on the heat. Add another tablespoon of vegetable or peanut oil, then add the grated ginger and minced garlic. Saute for about a minute, then remix the sherry mixture and add to the pan. Saute, stirring frequently, until thickened, another minute. Then add the eggplant and mix until the eggplant is coated by the sauce. Serve with scallions and rice. This is one of my favorite Chinese dishes! Love this sauce, going to use it on everything! This is the recipe I have been looking for! My husband’s aunt always gives up eggplant from her garden but I don’t really know a lot of good ways to use it and my husband isn’t a big fan in the first place. But he loves Chinese cuisine and I’ll bet he would think this is fantastic! Thanks! When I grow eggplant in my garden I’m always looking for unique ways to cook it and this looks fabulous! I love meatless dishes like this! And I’m always looking for new ways to use eggplants – thank you! That looks and sounds lovely, you can’t beat a quick stir-fry for a quick dinner! Looks so good! Just a question- is this 2tsp chili garlic paste and 2 tsp sambal oelek? Or is chili garlic paste the same thing as sambal oelek? Thanks! It’s 2 tsp chili garlic paste OR sambal oelek (depends on what you have in your pantry or at your grocery store). At my local store sambal oelek is easier to find, so I use that for the spice, but chili paste or chili garlic paste would work equally well. Let me know how it works out for you! I love this Asian dish! 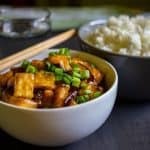 Most recipes I’ve found for Chinese dishes that I have are in Chinese, so thanks for figuring out a pretty authentic recipe! Thanks! Melody – I would substitute an additional tablespoon soy sauce and another tablespoon of rice wine vinegar in place of two tablespoons sherry in this recipe. While I prefer the eggplant hot, I’ve eaten leftovers of this Sichuan Eggplant recipe cold and it was still pretty tasty. Let me know how it works out for you! Looking forward to trying this recipe. All my gorgeous aubergines in the garden are almost recipe to harvest ! There’s nothing better than fresh aubergines from your own garden! I’m a big eggplant fan and am pretty sure I’ve had this in a restaurant and loved it, so can’t wait to give it a try. Sounds really flavorful! Will have to give it a try! My mouth is literally watering at the sight of it. 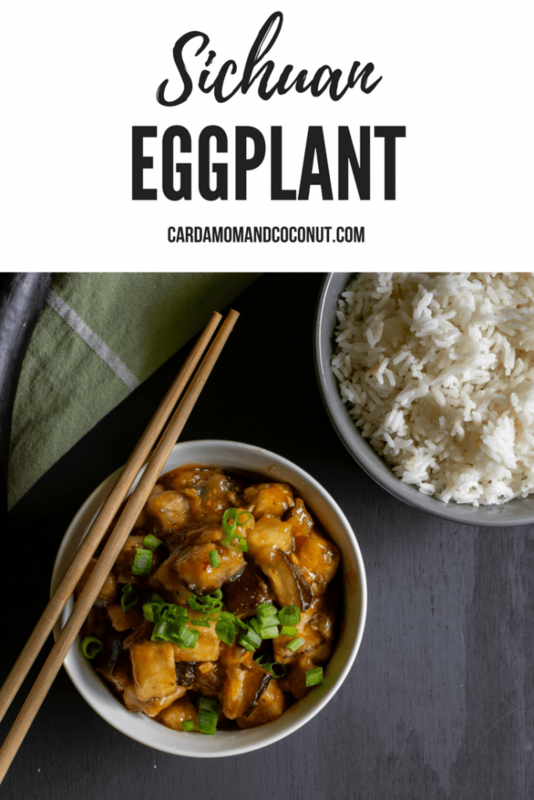 I love eggplants and more so the Asian flavors… this is a keeper recipe for sure! I’ve never had this, but it sounds delicious! That was so interesting reading about learning and speaking Chinese. I’m afraid I’d just have to point at something and hope for the best! I love recipes that spotlight eggplant. This looks so delicious and perfect for a weeknight meal. This looks amazing! My only question – do you peel the eggplant prior to coating in cornstarch? Thanks! Mary – I personally don’t peel the eggplant, but some people prefer eggplant without the peels, so feel free to peel it if you like it better that way!